Voted Best Renaissance Faire in the country in 2012, this summer's 26th annual Bristol Renaissance Faire will open Saturday, July 6, for nine weekends through Labor Day Monday, Sep. 2. While more than 200,000 visitors immersed themselves in the multi-sensory revelry of last summer's Bristol Renaissance Faire, partaking in an eclectic array of 16th Century arts, games, food, music, comedy and dance that earned top national honors from subscribers of Renaissance Magazine and the Renaissance Festival Podcast, Bristol's producers were not content to rest on their bum-rolls. This summer's creative team has again hit it out of the joust yard, with new construction on the 30-acre Faire site, enhanced immersive experiences for patrons, and an A-list of nationally-touring acts and artisans rivaling any season to date. "Over the past two and a half decades, we have hosted a thousand thrilling jousts, variety performances by the hundreds, trained more than 20,000 actors, and served too many turkey legs and pints of ale to count," said Linda McFeters, general manager and co-producer of the Bristol Renaissance Faire. "We are committed to building upon the unprecedented history, fantasy, merriment and spectacle that is the Bristol Renaissance Faire, as we kick off the next 25 years!" Sixteen Bristol entertainment stages feature nonstop music, merriment, feats of daring and an eclectic assortment of comedic performers who invite their audiences to become part of the act. Joining Faire favorites, including Dirk and Guido, the comedic sword-fighting duo known as "The Swordsmen," ropewalker, juggler and foolish mortal MooNiE the Magnif'Cent, Guinness World Record-holding fire whip artist Adam Crack, the Barely Balanced acrobatic comedy troupe, and the Sturdy BeggarsTM Mud Show(r), will be newcomers Iris and Rose, singing sisters whose bawdy humor promises to have Faire-goers splitting their doublets, and, returning to Bristol for the first time in a number of years, hammered dulcimer virtuoso Glenn Morgan. Long-time Bristol jousters Steve Cowan (Sir Mauldron) and Matthew Mansour (Sir Maxmillian) will be putting a new twist on the Faire's most popular spectator sport this summer with ever-changing tests of skill guaranteed to keep man and horse at their competitive peak, and audiences on the edge of their seats. Hard-hitting and exquisitely choreographed, these new stylized jousting exhibitions will take place at various times throughout each Faire day. Among this summer's special musical guests, the explosive Celtic group, Tartanic, will appear during the Faire's first three weekends, and the Dread Crew of Oddwood, a folk-punk pirate band that's coined the genre "heavy mahogany," will perform the final two weekends. Making their Bristol debuts in 2013 are the sea shanty crooning Crimson Pirates (July 6-7), Jamila Lotus Bellydance Carnivale (July 13-14 and 20-21), the Iron Hill Vagabonds acoustic music duo (July 13-14, 20-21 and 27-28), and VaNa MaZi, with their unique brand of Gypsy Jazz (final four weekends, Aug. 10 through Sep. 2). As iconic as a giant, barbecue sauce-slathered turkey leg is to the Renaissance faire experience, Bristol patrons enjoy an extensive, and often unexpected, array of epicurean delights, ranging from Teriyaki chicken to Cornish pasties, and bakery-fresh scones to Italian strawberry gelato dipped in chocolate. New to this summer's Faire is Shehadeh Mediterranean cuisine, featuring falafel, hummus, baba ganoush, and other vegetarian delicacies. A large, new coffeehouse will bring specially-blended Old World Italian coffees to the Bristol beverage mix, which includes imported, domestic and non-alcoholic beers and ales, wines and mead, sassafras, lemonade and other popular selections. A perfect complement to the Faire's new hookah smoking tent, a variety of international sipping beverages, such as Turkish raki, a grape brandy, will be offered for the first time at this summer's Faire. Bristol's ever-expanding Marketplace offers a breadth and depth of unique shopping experiences that can't be found anywhere outside the country's top Renaissance faires. Nearly 175 artisans and crafters display wares ranging from stage-combat-approved swords and handmade chain maille to Scottish kilts, handcrafted leather masks, tapestry wall hangings, sterling silver jewelry, rare-edition books, hand-caned brooms, bamboo flutes, even steampunkery and jester socks. Often, patrons have the chance to watch potters, glass blowers, bowyers, blacksmiths and other working artisans create their wares on-site. Back by popular demand, the annual Bristol Marketplace Weekend is scheduled for Aug. 3-4 this summer. Shoppers spending $200 in one day can show their receipts at the Guest Services Gazebo and receive two free tickets to return to the Faire another 2013 weekend. Among the most anticipated events of this summer's Faire, Bristol's live action fantasy-play game, RenQuest, will return with an epic conclusion to its Chaos Trilogy. Originating in 2008, RenQuest brings the worldwide popularity of massively multiplayer online role-playing games, like World of Warcraft, into the live action dimension of the Renaissance Faire. The interactive theatrical gaming experience offers players an unprecedented opportunity to experience the Faire through completing quests, honing skills and defeating evil villains. The game spans the entire 30-acre Faire site and employs 30 non-playing characters dedicated to enriching the fantasy experience for patron-players. Kids Quests provide the Faire's younger patrons, ages 5 to 11, with two daily opportunities to embark on their own, age-appropriate adventures. The 30-minute adventures are led by Willow Spellworthy and Astrid Treeswift, and their pet trolls, Stirling and Bucket, as they set out to fight the evil Snifflewort. The Bristol Renaissance Faire is filled with kid-inspired experiences, including more than 30 games and rides, shows that make kids laugh, and special play areas bursting with whimsy and photo-snapping charm. Always entertaining and engaging, Bristol's Kids Kingdom boasts a climb-aboard pirate ship, giant sandbox, crafts and games activity center, its own theater and a full cast of beloved fairy tale characters. Magic shows, story-telling and interactive role-playing adventures take center stage throughout the day, and at 4:30 p.m., Queen Elizabeth herself shows up in Kids Kingdom for the celebrated Knighting Ceremony, at which she personally dubs all attending children lords and ladies. Other popular, kid-friendly diversions include mad-cap tea parties with Lady Ettie, kid pike drills at the Military Encampment, toy ship sailing on Mouseboro Pond, and chance encounters with the Faire's most elusive inhabitants, curious faeries known as Fantastikals. and Greek gods, July 27-28. Taking its framework from the summer day in 1574 when Her Majesty Queen Elizabeth visited the English hamlet of Bristol, the Bristol Renaissance Faire is located on 30 wooded acres, just west of I-94's Russell Road exit, near Kenosha, Wis. Open rain or shine, 10 a.m. to 7 p.m., every Saturday and Sunday, July 6 through Sep. 2, and on Labor Day Monday, Sep. 3, tickets are $19.95 for adults and $9.50 for children, ages 5 to 12. 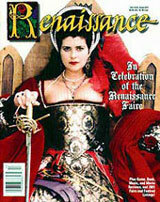 Advance ticket discounts are available at renfair.com or by calling (847) 395-7773.